Old Testament - Fascinating! verses today in Joshua chapter 5 verses 13 - 15 - "As Joshua approached the city of Jericho, he looked up and saw a man facing him with sword in hand. Joshua went up to him and asked, "Are you friend or foe?" "Neither one," he replied. "I am commander of the LORD's army." 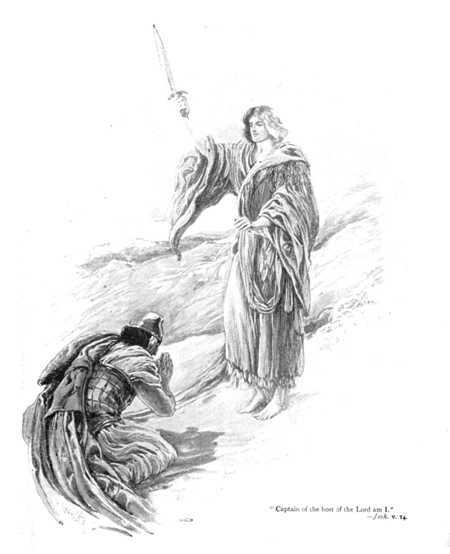 At this, Joshua fell with his face to the ground in reverence. "I am at your command," Joshua said. "What do you want your servant to do?" The commander of the LORD's army replied, "Take off your sandals, for this is holy ground." And Joshua did as he was told." Tyndale's One Year Bible Companion says this about these verses - "The captain of the host was no mere angel. His presence was an appearance of Christ in person. 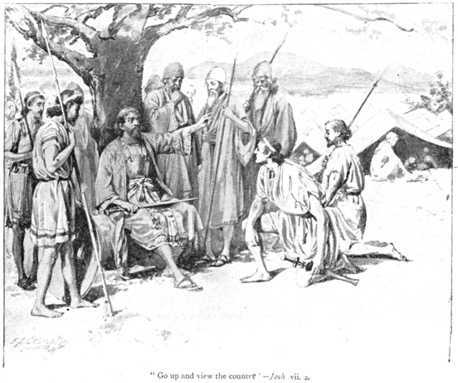 Joshua worshipped the captain; his worship was accepted and he was neither rebuked nor instructed otherwise." Whaddya think? Was this Jesus in these verses?? Bible.org's commentary on "The Captain of the Lord's Army" is at this link. In Joshua chapter 6 we read about the fall of Jericho to the Israelites - but... things take a turn for the worse in chapter 7 with the defeat at the city of Ai. It is interesting to note why the defeat happened in Ai, in verse 1 - "But Israel was unfaithful concerning the things set apart for the LORD." Think about it. Israel just had a great victory at Jericho and then they were unfaithful toward God. I wonder if perhaps we are like this in our lives today as well? Maybe something amazing happens in our life, and we get so swept up in the victory dance that we forget about God. And yet... it is God who gave us that victory. It is God who gives us every good thing we have in our lives. Are we being unfaithful in our lives concerning things set apart for God? Below is an image for verses 2 & 3 as Joshua sends out some men to spy on Ai, before the defeat" "Joshua sent some of his men from Jericho to spy out the city of Ai, east of Bethel, near Beth-aven. When they returned, they told Joshua, "It's a small town, and it won't take more than two or three thousand of us to destroy it. There's no need for all of us to go there."" Bible.org's commentary on Joshua chapter 5 is at this link, chapter 6 is at this link, and chapter 7 is at this link. New Testament - Beautiful verses today in Luke chapter 15 verses 8 through 10 - ""Or suppose a woman has ten valuable silver coins and loses one. Won't she light a lamp and look in every corner of the house and sweep every nook and cranny until she finds it? 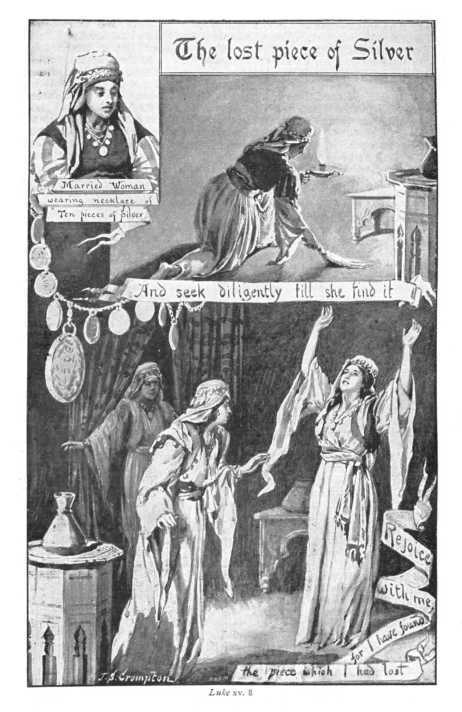 And when she finds it, she will call in her friends and neighbors to rejoice with her because she has found her lost coin. In the same way, there is joy in the presence of God's angels when even one sinner repents."" Do you believe that there was joy in the presence of God's angels when you repented? Or... when you will repent? That is a beautiful thought indeed! 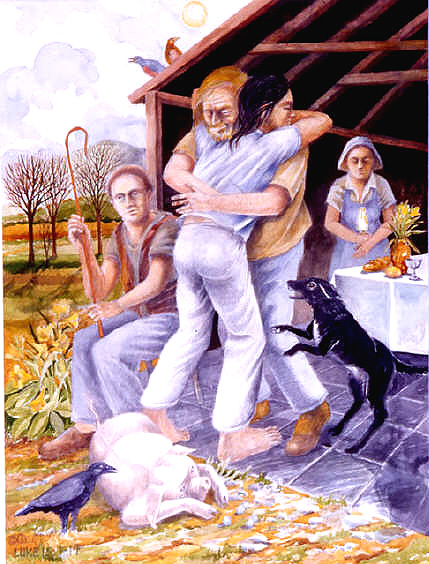 More beautiful verses today (22-24) as we read through the famous Prodigal Son story: ""But his father said to the servants, `Quick! Bring the finest robe in the house and put it on him. Get a ring for his finger, and sandals for his feet. And kill the calf we have been fattening in the pen. We must celebrate with a feast, for this son of mine was dead and has now returned to life. He was lost, but now he is found.' So the party began." Bible.org's commentary on our Luke chapter 15 readings today titled "Lost and Found" is at this link. Proverbs - Proverbs chapter 13 verse 1 may at first glance seem to be speaking about young children - but... I believe it can definitely speak to how we also should respond to God, our heavenly Father - "A wise child accepts a parent's discipline; a young mocker refuses to listen." Are you a wise child of God accepting His discipline in your life? Worship God: Today's readings in Luke about the Prodigal Son reminds me of the Jeremy Camp song "Take You Back:"
Have you run away from God? Click here to be taken back into His arms! Prayer Point: Pray that you have repented of your sins. Pray that you are evangelizing others you know to repent of their sins and turn to Jesus. Pray that the angels in heaven will rejoice over the lost you know being Found. 10 Then I fell prostrate at his feet to worship (to pay divine honors) to him, but he [restrained me] and said, Refrain! [You must not do that!] I am [only] another servant with you and your brethren who have [accepted and hold] the testimony borne by Jesus. Worship God! For the substance (essence) of the truth revealed by Jesus is the spirit of all prophecy [the vital breath, the inspiration of all inspired preaching and interpretation of the divine will and purpose, including both mine and yours]. 11 After that I saw heaven opened, and behold, a white horse [appeared]! The One Who was riding it is called Faithful (Trustworthy, Loyal, Incorruptible, Steady) and True, and He passes judgment and wages war in righteousness (holiness, justice, and uprightness). 12 His eyes [blaze] like a flame of fire, and on His head are many kingly crowns (diadems); and He has a title (name) inscribed which He alone knows or can understand. Of course the one Joshua sees is JC (Jesus the Christ) and I think he is seeing Him in His Second Coming as the One riding on the write horse, the one coming with a sword in his mouth (Folks its figurative). What is really jumping out at me is the passage is the fourteen verse where the Captain states on the question of friend or foe, 14 "Neither one," he replied. "I am commander of the LORD's army." Us Christians, we Believers have this bad habit of bullying our way through things and past people claiming God is own our side, but this seems to say, “Stop! Not so fast, I’m on the side of Truth. It is presumptuous of us to believe that because we are Christians everything we do is “Righteous.” If we are wrong and trying to push our own agenda, then we are dreamers and or false prophets! The pastor of the church I delivered a “Bad Report” to the congregation about two months ago. It seems that the sheer size and number of our congregation (22,000) was going over to a well known franchised restaurant whose name has a crustacean in its title and demanding to be seated in front of everyone else waiting because after all we are member of CCC (Christian C. Center), giving a very bad taste in the mouth of non-believers and painting the members as being arrogant, which the ones demanding their way were surly are. As Christians we are supposed to be a fragrance not an odor. Joshua 7: 10 But the LORD said to Joshua, "Get up! Why are you lying on your face like this? 11 Israel has sinned and broken my covenant! When is it the right time to pray? Obviously from this passage the time Joshua chose to pray was not the right time. When was the time? I believe they should have prayed before they went to attack the city of Ai. Israel was handed a big victory, Jericho. They then assumed from that victory that they, not God, were the source and reason for their victory. I have been in the same predicament as Israel. I’ve experienced great victories in my walk and then I’ve assumed that God sanctioned everything I planned to do after that victory. Only problem I never checked with God until after my harebrain scheme failed. 31 "His father said to him, `Look, dear son, you and I are very close, and everything I have is yours. 32 We had to celebrate this happy day. For your brother was dead and has come back to life! He was lost, but now he is found!' "
In the late 70’s or early ‘80’s, we were also encouraged to destroy all music that was not about God or Jesus. With some friends, we burned our albums. We felt both holier (than thou) and remorseful. Thinking back, I really don’t think my Carole King Tapestry or my Best of Bread Albums we’re anti-Christ. LOL! I am picky whose and what music I listen to, but listening to music is no different than drinking lemonade. Lemonade cannot be made holy. It is what you allow to speak to you and if you are always aware of that, the Spirit will let you know if it is not God honoring. I do try to eliminate the music of Jesus haters, demon worshippers, etc. as I do not want to support people, even if it is a “good” song, who openly reject or dishonor God. Of course, I don’t know about most, but when I am made aware, I see it as a warning from the Spirit. I like music from all different venues, from Opera & Jazz to country and hip-hop. Well, maybe one or two songs from Hip-hop. LOL! I like instrumental, a capella, choirs, rock bands, musicals, steel drums, and barbershop quartets. I appreciate gifted artists. A lot of what is called worship music does not stir me, and a lot of the contemporary Christian music, sounds all the same, but songs like Above All or Be Still My Soul and others, absolutely reach my soul. I didn’t realize that you have only been a Christian for seven years. You must have a good discipler. I have recommended OYBB to many as I live how you attach a music video to every day. I notice that this year it is mostly the acoustical versions. Yes, we notice. Thank you for what you do.